The political party manifestos for the 2017 General Election have been published and they offer rather different positions regarding Brexit. The Conservative and Unionist Party - (unlike 2015, they use their full title in the manifesto) - seeks a "deep and special partnership" with the EU but also states starkly that "no deal is better than a bad deal." The Labour Party accepts Brexit but puts forward its case for a new approach to negotiations. The Liberal Democrats will fight against a "hard Brexit" and offer a referendum on the deal reached with the EU. The 2 year Article 50 clock is already ticking - Article 50(3) TEU - and the immense amount of negotiation to be conducted is scheduled to begin on 19th June and negotiations will be conducted in accordance with EU Council guidelines - (previous post). The 2 year period is intended to be used to "negotiate and conclude an agreement ... setting out the arrangements for ... withdrawal, taking account of the framework for ... future relationship with the Union." It is not entirely clear what a framework for future relationship entails but it seems likely that it will have to address fundamental points such as the UK's financial settlement and the rights of EU citizens in the UK and UK citizens in the EU(27). Whatever the final content of the withdrawal agreement, much detail will remain to be addressed after the 2 year period expires. Any view that everything can be concluded by March 2019 appears to be unrealistic. At the outset of the Conservative and Unionist Party manifesto Theresa May states: "The next five years are the most challenging that Britain has faced in my lifetime." 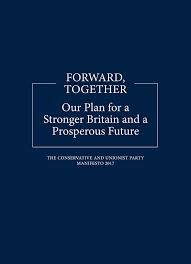 The manifesto refers to a smooth and orderly departure from the EU with adherence to Theresa May's "Lancaster House 12 principles" to seek a "deep and special partnership" with the EU. We are told that "no deal is better than a bad deal" which raises the spectre of the UK walking away from the negotiating table and blaming the EU for failure to reach agreement. The British government's approach is in the White Paper on the UK's exit from, and new relationship with, the EU. There is also the White Paper on the Great Repeal Bill. The manifesto continues to say - "We will make sure we have certainty and clarity over our future, control of our own laws, and a more unified, strengthened United Kingdom. We will control immigration and secure the entitlements of EU nationals in Britain and British nationals in the EU. We will maintain the Common Travel Area and maintain as frictionless a border as possible for people, goods and services between Northern Ireland and the Republic of Ireland. Workers’ rights conferred on British citizens from our membership of the EU will remain." The manifesto confirms (yet again) that the UK will not be a member of the single market or customs union but a comprehensive freed trade and customs agreement will be sought. There is tension between this and the EU's stated position that the relationship between the Union and a non member State cannot offer the same benefits as Union membership. There is a wish to work together in the fight against crime and terrorism, to collaborate in science and innovation and perhaps to participate in specific European programmes -but no examples of such programmes are given. Perhaps one might be Atomic Energy - bearing in mind that Brexit also entails leaving the European Atomic Energy Community (Euratom). It is recognised that any participation may require a financial contribution. What is omitted is any discussion of how any disputes arising from such participation would be settled. The EU often has a preference to use their already established mechanism - the Court of Justice of the EU - whilst this is ruled out by many Conservatives. The manifesto accepts that there will be a "fair settlement of the UK's rights and obligations as a departing member State" and it is stated that it is necessary to agree the terms of the UK's future partnership alongside withdrawal, reaching agreement on both within the two years allowed by Article 50. It is not clear whether "terms of future partnership" differs from the "framework for future relationship" which has to be taken account of in the withdrawal agreement referred to in Article 50. "We will enact a Great Repeal Bill. Our laws will be made in London, Edinburgh, Cardiff and Belfast, and interpreted by judges across the United Kingdom, not in Luxembourg. The bill will convert EU law into UK law, allowing businesses and individuals to go about life knowing that the rules have not changed overnight. This approach means that the rights of workers and protections given to consumers and the environment by EU law will continue to be available in UK law at the point at which we leave the EU. The bill will also create the necessary powers to correct the laws that do not operate appropriately once we have left the EU, so our legal system can continue to function correctly outside the EU. Once EU law has been converted into domestic law, parliament will be able to pass legislation to amend, repeal or improve any piece of EU law it chooses, as will the devolved legislatures, where they have the power to do so. As powers return from the EU, we will be able to determine the level best placed to take decisions on these issues, ensuring that power sits closer to the people of the United Kingdom than ever before. We expect that the outcome will be a significant increase in the decision-making power of each devolved administration but we must also ensure that as we leave the EU no new barriers to living and doing business within our own union are created. In some areas, this will require common UK frameworks. We will work closely with the devolved administrations to deliver an approach that works for the whole of the United Kingdom and reflects the needs and individual circumstances of Scotland, Wales and Northern Ireland." Although the manifesto is not specific, it may be that "common UK frameworks" will require alteration to the devolution legislation. The aim is to avoid Brexit somehow creating problems with internal UK trade between the different parts of the UK. The manifesto lacks detail. The European Union’s Charter of Fundamental Rights into UK law will not be absorbed into the law in the UK. Whatever its merits, there is little love for this Charter at Westminster. It will be recalled that the Labour government negotiated a so-called "opt-out" which has proved to be of limited value since the Charter applies to those areas of national law coming within the (wide) scope of EU law. - see post of 13th April 2016 - UK and the EU (7) - Your Rights. 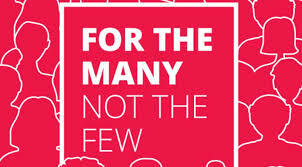 The Labour Party manifesto contains a section on Negotiating Brexit in which it is stated that Labour would replace the Conservative government's White Paper on Brexit. They would have a strong emphasis on retaining the benefits of the Single Market and Customs Union said to be essential for maintaining industries, jobs and businesses in Britain. They would also have a European Union Rights and Protection Bill in place of the Conservative Great Repeal Bill. This would ensure there is no detrimental change to workers’ rights, equality law, consumer rights or environmental protections as a result of Brexit. 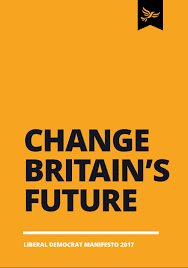 The Liberal Democrats manifesto states - "We passionately believe that Britain is better off in the EU. We will fight against the Conservatives disastrous hard Brexit - their choice to make the UK a poorer place." Their manifesto promises a referendum on the deal reached at the end of the Article 50 negotiations and the Party pledges to "fight a hard Brexit." See also Rights Information - The Election and Human Rights- here Rights Information takes a look at the manifestos of 7 political parties. EU Withdrawal ~ "divorce fee"